Idly is the most popular South Indian breakfast item. 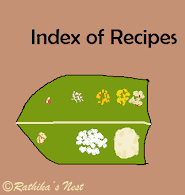 Traditionally idlies are steamed in a mould kept inside a closed vessel (இட்லி குண்டான்). Idly mould (இட்லி தட்டு) is available in varying sizes starting from single plate with 3-5 moulds. Idly cooker may be used for steaming. Alternatively, you may use the pressure cooker or rice cooker. Microwave safe idly mould is also available for using in a microwave oven. *Methi seeds make the idlies soft. However, they also make the idlies look light yellowish in color. Note: Ingredients mentioned here make approximately 40 idlies. Please note the number of idlies depend on the size of the idly mould you use. How to prepare the batter: Wash par-boiled rice, and urad dhal along with methi seeds separately. Soak them in sufficient water using different containers, for 4-5 hours. Grind urad dhal and methi seeds using a wet grinder, till it becomes a smooth spongy mass (நன்கு குடைய அரைக்கவும்). Transfer the dahl batter (உளுத்த மாவு) into a large container. Now grind soaked rice using the wet grinder into a fine paste. Transfer the rice batter (அரிசி மாவு) to the same container. Add salt, mix dhal and rice batters very well. Allow the batter to stand overnight or at least for eight hours. Next morning, mix the batter well. Add water, if required, to make the batter into pouring consistency. You may refrigerate the batter and use it to make idlies as needed. Note: Use a larger container to hold the batter overnight, as the batter will rise (மாவு பொங்கும்) when fermented. How to prepare idlies: Mix the batter well before using. Smear the idly moulds with sesame oil. Pour batter up to the brim in each mould. Pour 300ml of water in a pressure cooker or rice cooker. Place the idly mould inside the cooker and close the lid. DO NOT place the weight. Steam the idlies for 5-7 minutes. Once the idlies are cooked, the steam will emit idly flavor. Switch off the stove and remove the idly mould. Allow the idlies to cool for a minute or two. Remove the idlies from the mould and serve hot with chutney and sambar. Note: You may use a wooden tooth pick to test if the idlies are cooked or not. Wet the tooth pick and drive it through the hot idly in the mould. If the idly is cooked, the tooth pick will come out smoothly with no batter sticking on it.